EFCC sends more proof to UK on Diezani $1.7b deals. 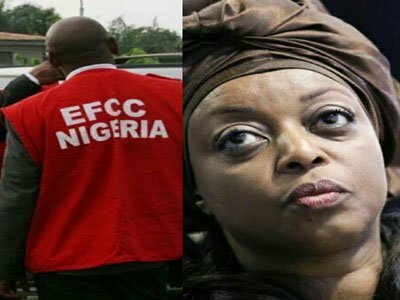 In the on going investigation of former Petroleum Resources Minister Diezani Alison-Madueke, Two Economic and Financial Crimes Commission (EFCC) detectives have been dispatched to the United Kingdom (UK) with more evidence. Mrs. Alison-Madueke’s latest trouble borders on the uncovering of $1.7billion contracts involving her and two business associates. Mrs Alison-Madueke, who has temporarily forfeited some assets, may lose five more. The assets are under verification. The anti-graft agency is also investigating the ex-minister on the whereabouts of $15.8billion NLNG dividends. She is being investigated alongside some former officials of the Nigerian National Petroleum Corporation (NNPC) and the Nigerian Petroleum Development Company (NPDC), which is the upstream arm of the NNPC in charge of oil exploration and production. But the United States, the UK, the EFCC and other agencies in some jurisdictions may harmonise the investigations. A source in EFCC said: “You know the Department of Justice (DOJ) in the United States released the details of the underhand deals surrounding the oil contracts bordering on the implication of the ex-Minister and two associates -Chief Jide Omokore and Kola Aluko. Responding to a question, the source added: “The EFCC has gone far in probing the whereabouts of about $15.8billion NLNG dividends between 2000 and 2014. “In an audit report sent to EFCC by the Nigerian Extractive Industry Transparency Initiative( NEITI), it was indicated that ‘it is doubtful if the entire $15.8 billion due from 2000 to 2014 is still intact’. “The funds were neither paid into the Consolidated Revenue Fund of the Federation nor the Federation Account. Five more choice properties belonging to the former minister are said to have been identified. “We are trying to verify these assets and they will soone be confiscated in line with Section 7 of the EFCC Act,” another source, lwho pleaded ,not to be named so as not to jeopardise the investigation said. Section 7 states: “The commission has power to (a) cause any investigations to be conducted as to whether any person, corporate body or organisation has committed any offence under this Act or other law relating to economic and financial crimes. Section 13 of the Federal High Court Act reads in part : “The Court may grant an injunction or appoint a receiver by an interlocutory order in all cases in which it appears to the Court to be just or convenient so to do. EFCC Acting Chairman Ibrahim Magu is in Port Harcourt for what a source described as a “morale booster”trip following the recent shooting of an official. Magu, who arrived in Port Harcourt last night, would also inspect some seized assets. The source added: “There are many high-profile suspects from Rivers-Bayelsa axis whose properties have been seized. Those concerned are ex-First Lady Patience Jonathan, some former presidential aides and Diezani, among others. “The EFCC chairman will assess some of the seized assets. We have already handed over some of the assets to some firms to manage. “Apart from meeting critical stakeholders, Magu will also pay a morale booster visit to to some staff in the Port Harcourt zone who are constantly being attacked, harassed and intimidated”.